As the book starts we are already on the other side of a dystopian meltdown. The rebuild, worldwide will be painfully slow, but progress will be made. The story is set in one small area, the area that will be served by one new power station. Some of the wealthy, in their gated communities have come through a worldwide conflagration relatively unscathed, not so most of the population. There is a lot of excitement, heaps of intrigue, and a very clever interplay of characters in the plot. Sometimes the detail was actually too clever for me, to mathematically complex, but I breezed on to find, as I suspected, that the maths of who did what to whom and when didn't particularly matter. The story is in the series of results from the complex interplay of competing and variously empowered players. I don't hesitate in giving this book five stars, but the proof-reader needs eliminating and replacing before the next book, just as unceremoniously as are so many of Miller's characters that fail to keep pace with this developing new social, material and financial order. One more edit would be more than worthwhile, so I hope Miller organises just that. Miller's writing style is robust, eloquent, and fashionable short of superfluous adjectives and adverbs. This Hemingwayesque style is popular, certainly, though less plot detail and more expansive description would have enriched the reading for me. I would have liked to have been given a few more colours from the peeling paint, and a deeper penetration of the souls driving the characters. I enjoy more ingredients than a plot demands. But as it is the word count is fairly long, as I said, we see a complex sum. The author is an intellectual thinker, with many scientific and social views about where the future might go. 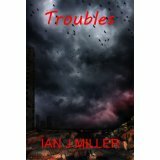 Miller combines this with writing very engaging fiction that works on so many levels. I certainly enjoyed reading 'Troubles'. Miller does just exactly what all good speculative fiction writers do, entertains with aplomb whilst providing food for both frivolous and serious thought.